Readers who fell in love with Precious Ramotswe, proprietor of The No. 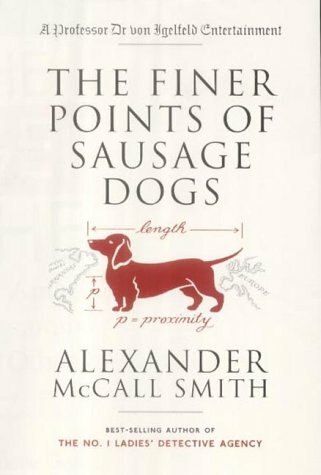 1 Ladies' Detective Agency, now have new cause for celebration in the protagonist of these three light-footed comic novels by Alexander McCall Smith. Welcome to the insane and rarified world of Professor Dr. Moritz-Maria von Igelfeld of the Institute of Romance Philology. Von Igelfeld is engaged in a never-ending quest to win the respect he feels certain he is due-a quest which has the tendency to go hilariously astray. In The Finer Points of Sausage Dogs, Professor Dr. Von Igelfeld is mistaken for a veterinarian and not wanting to call attention to the faux pas, begins practicing veterinary medicine without a license. He ends up operating on a friend's dachshund to dramatic and unfortunate effect. He also transports relics for a schismatically challenged Coptic prelate, and is pursued by marriage-minded widows on board a Mediterranean cruise ship.